The $2million Group I VRC Emirates Stakes at Flemington on Saturday was won in scintillating style by talented entire Awesome Rock (5h Fastnet Rock x Awesome Planet, by Giant's Causeway), who combines the blood of two champion Coolmore sires. 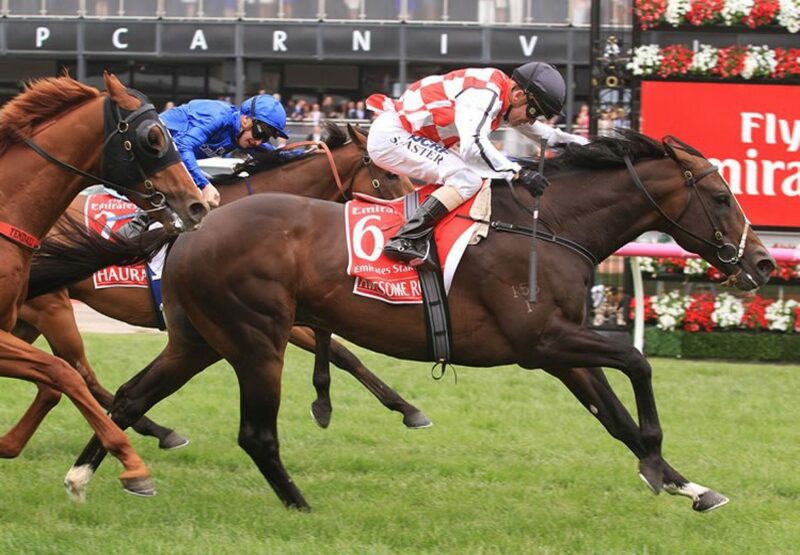 Awesome Rock won the Group I VRC Australian Cup during the autumn, only to lose the race in the steward’s room following a successful protest, but has now gained sweet atonement from that disappointment. Prepared by Leon and Troy Corstens, Awesome Rock was a good last start fifth in the Group I MVRC Cox Plate behind superstar mare Winx and had two weeks to regroup from that encounter. Ridden a forward race by Steve Baster to travel up on the pace, Awesome Rock kept going to the line to win the lucrative 2000 metre feature by three-quarters of a length. "At Moonee Valley I was really concerned about the wet track and to his credit he held on well," Baster said. "Today on a firm track I knew he'd run really well. It's the first time I've been able to ride him forward this time in. "With this headwind I was a bit concerned but Vadamos wanted to go a bit too hard and gave us a perfect trail, perfect cover and basically the perfect slingshot into the race." Father and son training duo Leon and Troy Corstens had the heartbreak of losing the Australian Cup during the autumn, Saturday's victory the first official Group I success for the partnership. "We've been confident the whole way along," Troy Corstens said. "We've always thought he had the Group one in him. "When it goes right it's fantastic. It's my first Group one and to do with dad is amazing. "Not a lot of people get to spend a lot of time with their dad. I get to spend six or seven hours with him a day and as quirky as he is, he's a champion." Leon Corstens indicated that redemption in the Australian Cup would be the likely autumn target for Awesome Rock. The first foal of Group III wining Giant’s Causeway (USA) mare Awesome Planet, Awesome Rock was bred by WA based breeders Alan and Sue Olive of Gold Front Racing and Breeding. A $575,000 Magic Millions purchase from the Newgate Farm draft for Spicer Thoroughbreds,he runs for a big syndicate and has the overall record of four wins and seven placings from 25 starts with prizemoney topping $2million. Awesome Rock is the 26th Group I winner for champion sire Fastnet Rock.